For the Wyoming newspaper, see Casper Star-Tribune. The Star Tribune is the largest newspaper in the U.S. state of Minnesota. It originated as the Minneapolis Tribune in 1867 and the competing Minneapolis Daily Star in 1920. During the 1930s and 1940s Minneapolis's competing newspapers were consolidated, with the Tribune published in the morning and the Star in the evening. They merged in 1982, creating the Star Tribune. After a tumultuous period in which the newspaper was sold and re-sold and filed for bankruptcy protection in 2009, it was purchased by local businessman Glen Taylor in 2014. The Star Tribune serves Minneapolis and is distributed throughout the Minneapolis–Saint Paul metropolitan area, the state of Minnesota and the Upper Midwest. It typically contains a mixture of national, international and local news, sports, business and lifestyle content. Journalists from the Star Tribune and its predecessor newspapers have won six Peabody Awards, including two in 2013. The newspaper's headquarters is in downtown Minneapolis. Star manager John Cowles, Sr. In 1944, John Cowles, Sr. hired Wisconsin native and former Tulsa Tribune editor William P. Steven as managing editor of the two newspapers; Steven became vice-president and executive editor in 1954. During his tenure in Minneapolis, he was president of the Associated Press Managing Editors Association in 1949 and first chairman of the organization's Continuing Study Committee. By August 1960 John Cowles, Jr. was vice-president and associate editor of the two papers, and it was soon apparent that he disapproved of Steven's hard-nosed approach to journalism. When Steven chafed under the younger Cowles's management, he was fired. After Steven's ouster, John Cowles Jr. was editor of the two newspapers; he became president in 1968 and editorial chairman the following year. He had a progressive political viewpoint, publishing editorials supporting the civil-rights movement and liberal causes. In 1982 the morning Tribune was discontinued due to low circulation, and the staffs of the Star and Tribune were transferred to the merged Minneapolis Star and Tribune. 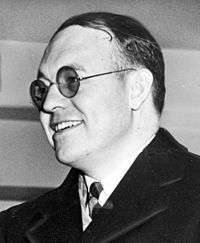 Cowles, Jr. fired publisher Donald R. Dwight. His handling of Dwight's termination led to his removal as editor in 1983, although his family retained a controlling financial interest in the newspaper. In 1983, the Star Tribune challenged a Minnesota tax on paper and ink before the Supreme Court of the United States. In Minneapolis Star Tribune Co. v. Commissioner, the court found that the tax (which targeted specific newspapers) was a violation of the First Amendment. In 1987 the newspaper's name was simplified to Star Tribune, and the slogan "Newspaper of the Twin Cities" was added. In 1998 the McClatchy Company purchased Cowles Media Company for $1.4 billion, ending the newspaper's 61-year history in the family in one of the largest sales in American newspaper history. Although McClatchy sold many of Cowles's smaller assets, it kept the Star Tribune for several years. On December 26, 2006 McClatchy sold the paper to private-equity firm Avista Capital Partners for $530 million, less than half of what it had paid for Cowles eight years earlier. In March 2007 Pat Ridder was appointed Star Tribune publisher after his predecessor, J. Keith Moyer, left the newspaper after the sale. Ridder is a member of the Ridder family, which had owned Knight Ridder (publishers of several newspapers, including the rival St. Paul Pioneer Press). Ridder's arrival resulted in litigation when it was discovered that he had stolen a hard drive containing information about employees and advertisers which the Pioneer Press called "trade secrets". Ridder also took two high-ranking staff members with him to the Minneapolis paper, which raised eyebrows since such employees usually have non-compete clauses in their contracts. On September 18, 2007 Ridder was removed from his post by a Ramsey County judge, and he resigned on December 7. On January 15, 2009, the paper, the country's 15th-largest daily, filed for bankruptcy under Chapter 11. On September 17 the United States Bankruptcy Court for the Southern District of New York approved a bankruptcy plan for the Star Tribune, which emerged from bankruptcy protection on September 28. The paper’s senior secured lenders received about 95 percent of the post-bankruptcy company. Wayzata Investment Partners became majority owner of the Star Tribune Company in August 2012, with a 58 percent stake. In 2014, the company was acquired by Glen Taylor. Taylor said that the Star Tribune would be less liberal under his ownership, but the newspaper had already begun a shift and he would focus on accurately reporting both sides of all issues. In May 2015, the company acquired alternative weekly City Pages from Voice Media Group. After the 1987 formation of the Star Tribune, the newspaper was published in three editions: one for Minneapolis and the western suburbs, one for St. Paul and the eastern suburbs and a state edition for Minnesota and the Midwest. The St. Paul edition was discontinued in 1999 in favor of a metro edition for the Minneapolis–Saint Paul area and a state edition for areas beyond the metropolitan area. Although the newspaper competes with the Saint Paul-based Pioneer Press in the Minneapolis-Saint Paul area, the Star Tribune is more popular in the western metropolitan area and the Pioneer Press more popular in the eastern metro area. The newspapers share some printing and delivery operations. The Star Tribune went online in 1995, introducing the StarTribune.com website the following year. In 2011, the website erected a paywall. 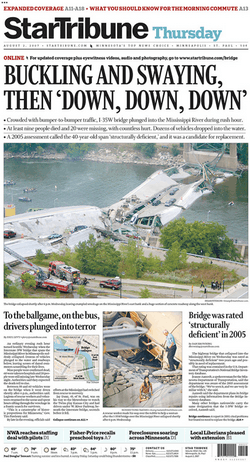 The Star Tribune has five main sections: main news, local news, sports, business and variety (lifestyle and entertainment). Special weekly sections include Taste (restaurants and cooking), travel, Outdoors Weekend and Science + Health. The Sunday edition has a larger editorial and opinion section, Opinion Exchange. The Wednesday edition includes an extra section focusing on local news and issues, with separate versions for the northern, southern, northwestern and southwestern regions of the newspaper's circulation area. Michael J. Klingensmith is publisher and CEO of Star Tribune Media Company, with overall responsibility for its news and business operations. He was hired in 2010. After the Star Tribune's bankruptcy its former ownership group, led by New York City-based Avista Capital Partners, has no stake in the company. After the city's newspapers were consolidated by the Cowles family, their offices were gradually moved to the former the Daily Star headquarters in downtown Minneapolis. The building was renovated in 1939-1940, and expanded in a larger renovation from 1946 to 1949. After 1949, the building housed the offices and presses of the Star and the Tribune. During the 1980s an annex, the Freeman Building, was built across the street from the headquarters and connected with a skyway. In 2014, the company announced that it would relocate from the 95-year-old headquarters building to Capella Tower to make way for development around nearby U.S. Bank Stadium. Demolition of the buildings began in 2014, with the last employees relocating in mid-2015 and the demolition completed later that year. 1 2 "2016 Display Rate Book" (PDF). Star Tribune. 1 2 3 4 5 Morison, Bradley (1966). Sunlight on Your Doorstep: The Minneapolis Tribune's First Hundred Years. Minneapolis: Ross & Haines Inc.
↑ Nathanson, Iric. "'Newspaper with a soul': The short-lived Minnesota Daily Star launched in 1920". MinnPost. 1 2 3 "Timeline: A look at history of Star Tribune". Minneapolis Star-Tribune. ↑ "Minneapolis Man Gets Houston Post". Lubbock Avalanche-Journal. September 20, 1960. p. 39. Retrieved June 14, 2014. ↑ "The Press: Let History Try". Time. August 29, 1960. Retrieved October 10, 2011. 1 2 Royce, Gradon (19 March 2012). "Publisher John Cowles Jr., who shaped the Twin Cities for 50 years, dies". Minneapolis Star Tribune. ↑ "Minneapolis Star & Tribune Company v. Minnesota Commissioner of Revenue". Oyez. ↑ "McClatchy in $1.4 Billion Cowles Deal". The New York Times. 14 November 1997. ↑ Ellison, Sarah (December 26, 2006). "McClatchy's Minneapolis Sale Aids Web Efforts". The Wall Street Journal. Retrieved June 14, 2014. ↑ McKinney, Matt (March 5, 2007). "Par Ridder named Star Tribune CEO, publisher". Star Tribune. Retrieved June 4, 2008. ↑ Stawicki, Elizabeth (September 18, 2007). "Judge critical of Par Ridder's conduct in ruling". Minnesota Public Radio. Retrieved June 14, 2014. ↑ Welbes, John (February 1, 2008). "Star Tribune to put headquarters, other land up for sale". Pioneer Press. Retrieved February 1, 2008. ↑ Orrick, Natasha R. (February 1, 2008). "Star Tribune trying to sell headquarters". Minneapolis / St. Paul Business Journal. American City Business Journals. Retrieved February 1, 2008. 1 2 "Star Tribune names Klingensmith as new publisher". Minneapolis / St. Paul Business Journal. American City Business Journals. January 7, 2010. Retrieved June 14, 2014. ↑ Schmickle, Sharon (January 15, 2009). "Star Tribune files for bankruptcy and lists unsecured creditors". MinnPost. Retrieved June 14, 2014. ↑ Kary, Tiffany (January 16, 2009). "Star Tribune Files for Bankruptcy After Ads Decline". Bloomberg News. Retrieved June 14, 2014. ↑ Fitzgerald, Mark (January 16, 2009). "Economist: Avista Has Only Itself To Blame In 'Strib' Bankruptcy". Editor & Publisher. Retrieved June 14, 2014. ↑ Pérez-Peña, Richard (January 6, 2009). "Bankruptcy for another U.S. paper". International Herald Tribune. Retrieved June 14, 2014. 1 2 Newmarker, Chris (September 17, 2009). "Star Tribune to emerge from bankruptcy, no new publisher named". Milwaukee Business Journal. American City Business Journals. Retrieved June 14, 2014. ↑ Phelps, David (August 12, 2012). "Star Tribune gains a majority owner". Star Tribune. Retrieved June 14, 2014. ↑ Bjorhus, Jennifer (April 2, 2014). "Wolves owner Glen Taylor makes cash offer to buy Star Tribune". Star Tribune. Retrieved June 14, 2014. ↑ Robson, Britt (April 16, 2015). "New owner Glen Taylor: less liberal Star Tribune ahead". MinnPost. Retrieved March 7, 2015. ↑ Yuen, Laura (2015-05-06). "Star Tribune says it will buy City Pages". Minnesota Public Radio News. Retrieved 2015-05-16. ↑ McGuire, Tim (12 December 1999). "Newspaper aims to serve the entire metro area, not pieces of it". Minneapolis Star Tribune. ↑ Desky, Mark (July 27, 1987). "Twin Cities Paper Changes Name, Distribution". AdWeek: 43. ↑ Brauer, David. "Mapping the newspaper war, 25 years after the Star Tribune invaded Pioneer Press turf". MinnPost. ↑ Collins, Bob. "Combining delivery, PiPress and Strib get cozier". Minnesota Public Radio. ↑ Brauer, David. "Strib metered pay wall: Web traffic down 10-15 percent, revenue up". MinnPost. ↑ "1948 Winners". The Pulitzer Prizes. ↑ "1959 Winners". The Pulitzer Prizes. ↑ "1968 Winners". The Pulitzer Prizes. ↑ "1990 Winners and Finalists". The Pulitzer Prizes. ↑ "The 2013 Pulitzer Prize Winners: Editorial Cartooning". The Pulitzer Prizes. ↑ "The 2013 Pulitzer Prize Winners: Local Reporting". The Pulitzer Prizes. ↑ "A Eulogy: The Minneapolis Star-Tribune Building". Hennepin County Library Special Collections Tumblr. ↑ Lileks, James (21 March 2015). "Streetscapes: Star Tribune is last of Minneapolis newspaper buildings". Minneapolis Star-Tribune. ↑ Moore, Janet (13 May 2014). "Star Tribune to move headquarters to Capella Tower in 2015". Minneapolis Star-Tribune. ↑ "Star Tribune staff says goodbye to old building". MPR News. Wikimedia Commons has media related to Star Tribune. A collection of survey data and statistics used to produce the Metro Poll and the Minnesota Poll for the Minneapolis Star and Tribune Company is available for research use at the Minnesota Historical Society. Nieman Journalism Lab. "Minneapolis Star Tribune". Encyclo: an encyclopedia of the future of news. Retrieved 1 April 2012.